Assistant manager Paul Raynor says he is disappointed with the manner of Mansfield Town’s 4-0 defeat at home to Nottingham Forest. Stags trailed 1-0 at the break following a bit of magic from Jason Cummings. But they ran out of steam in the closing stages as ruthless Forest bagged three goals in the closing 21 minutes to complete a comprehensive win. And Raynor feels that three games inside a week against Championship opposition may have been a bridge too far. “I am disappointed by the performance, we have had two good performances against Championship sides but today was disappointing,” he said. “We lacked a bit of cohesion and intensity, maybe the two games have taken something out of us. We were certainly down a notch in terms of our pressure with and without the ball. And Raynor confirmed that there were still at least five places to play for in Stags’ starting eleven in the season-opener against Crewe. 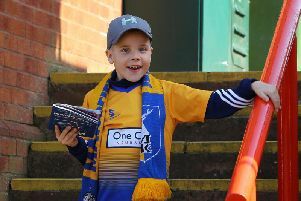 Mansfield will send teams to Matlock Town and Gainsborough Trinity on Tuesday night as the selection process gets narrowed down. He added: “There are five or six players pencilled in to start the first game of the season and we need to look at other players. “We will look at today especially, we got a lesson in one and two touch football. Everyone will have a chance to perform on Tuesday. “We will pick the bones out of it and watch the video. Follow www.chad.co.uk for the latest Mansfield Town news, views and match reports.